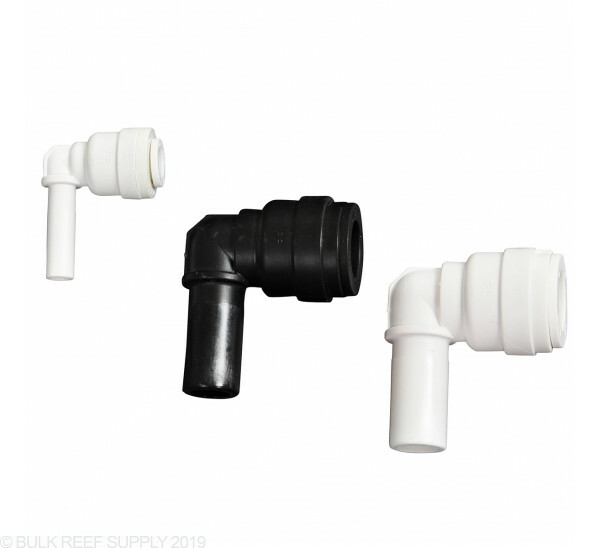 Mur-lok RO fittings are the only RO fittings that feature dual EPDM O-rings to ensure a straight leak-free fit. These high quality American made fittings are constructed with FDA approved materials. Just what I needed for my tight space. Very high quality item. So nice to be able to find the fittings we need at a reasonable price right here at BRS. Thank you. Exactly what I needed to connect a line into my RODI storage barrel. No leaks so far and it swivels which is great! When you have little room to play with and need to make the turn. These guys are a welcomed gift. Always have a few of them on hand for that in the night something went wrong moment. Best fittings. Never failed. Love them. I'm always buying from BRS. Super simple to use. Love them. I purchased similar fittings from Lowes before finding BRS. These are much higher quality for the same (or less). I have changed out the old fittings for Murlok fittings, and I highly recommend. Do these Mur-lok RO Elbow - Stem x Push Connect can be used for multiply uses? As well as heading head pressure before leaking? these do have multiple uses mostly for connecting to another Mur lok fitting to make an elbow which can be rotated. Feel free to let us know if you have any further questions! Does the 1/2" stem fit inside the 1/2" push connect?